Large apartment-like suites and a free hot breakfast get top ratings for the non-smoking Residence Inn Portland Scarborough where pets are welcome for a fee. Everything that makes guests feel at home can be found in the 78 suites of this three-story property. Each suite has a kitchen with stove microwave full-size refrigerator and toaster; a living room with full-size sofa bed; dining table; desk; and flat-panel HDTV with HBO and pay-per-view movies. Coffee and tea are complimentary and grocery shopping service is available. There's also a hot buffet breakfast every morning an evening reception during the week and dinner delivery service from a local restaurant. A 24-hour fitness center heated indoor pool and outdoor sport court offer exercise options. Additional amenities include a hot tub business center and coin laundry. Parking is free. 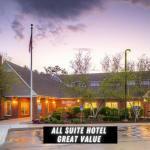 The hotel is two miles off the exit of I-95 and equally convenient to I-295. The Maine Mall South Portland's premier shopping destination is a mile-and-a-half away. The vibrant city of Portland with its historic waterfront unique boutiques and fine dining is seven miles from the hotel. Portland International Jetport is less than four miles away.